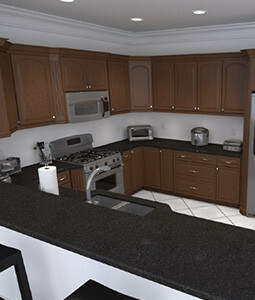 Our Flavor Finish countertops have a marble-like finish that will enhance any apartment home in today’s market. At Flavor Finish we strive to provide quality work and dependable service to the apartment industry. We offer a wide variety of resurfacing options for countertops, tubs, sinks, appliances, and more. As a locally owned and operated business, we complete all of our work with staff members who are equipped with the knowledge of on-site experience and exceptional service. Services provided by our uniformed technicians are backed by our two-year warranty on all workmanship. Call us today and give us the opportunity to enhance the look of your apartment homes!